Suzanne and I have been under the assumption, since 2009, that Anemo's name comes from the Hadiyya language and means something like "one who has found his father." This could still be the case, but it is now looking more likely that Anemo's birth mother gave him an Amharic name that instructs people not to gossip about him. Deto, Anemo's birth mother, told us through two translators (Hadiyya to Amharic, Amharic to English) that she initially gave Anemo the name ታሪኩ (Tariku), which is a name meaning "his history" in Amharic. At some point during the first fourteen months of Anemo's life—I believe when she started to make an adoption plan—Deto changed his name to Anemo with the hope of finding him a family instead of reminding him of his history. "Anemo" is a name we absolutely love, and we cannot imagine calling Anemo anything else, no matter what it's meaning. When I was discussing our son's name with Seife Temam, the administrative assistant here at ILAE, he suggested that Anemo's name was probably Amharic with a very specific meaning having to do with gossip and pronounced slightly differently from how I was saying it. Seife has been a great resource for my Amharic during my stay. He's also an absolutely lovely guy. So I asked Seife to say Anemo's name three different ways, just so I could hear the difference. 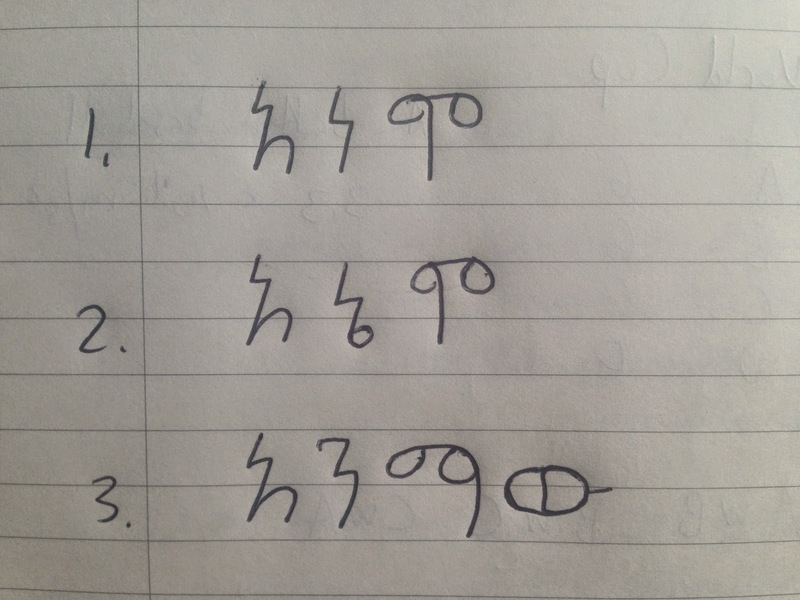 The first, spelled ኣነሞ, is the way we say Anemo's name, with a short 'e' vowel. The second, spelled ኣኔሞ, is the way Amharic speakers write his name (and the way Suzanne's dad pronounces it), with a long 'a' vowel; and the third, spelled ኣንማው, is the revelatory version that Seife introduced me to, which actually means "Do not gossip about him." Three possible spellings of Anemo's name, read by Seife below. Perhaps Anemo will feel a kinship with this dude from Adwa. I had the chance to do some more investigative work into Anemo's name recently, but I blew it. On Friday night Dawit took me to see his mother, who lives in an area of Addis called አየር ጤና (Ayer Tena), meaning "clean air." 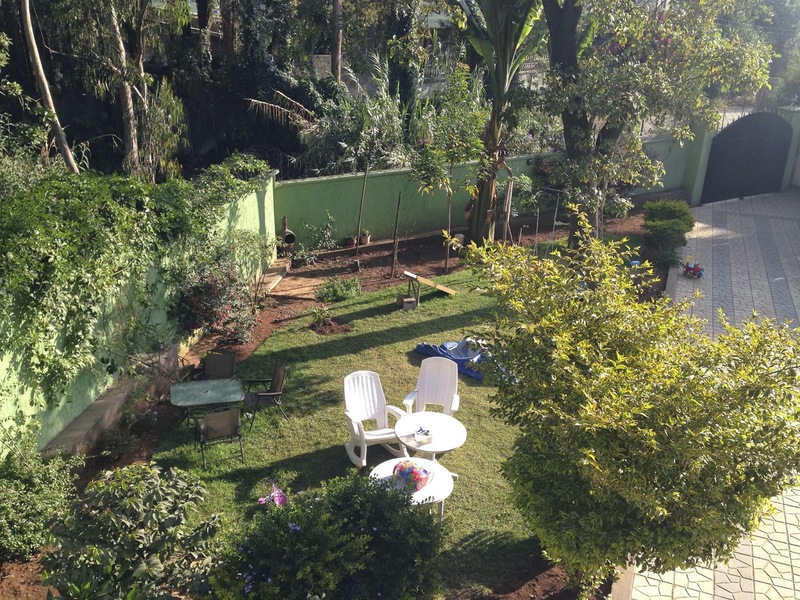 While no neighborhood in Addis deserves that name anymore due to the ubiquity of diesel fumes, Dawit's mother does live in an area with minimal car traffic, and I enjoyed seeing children playing in the street as the sun was going down. 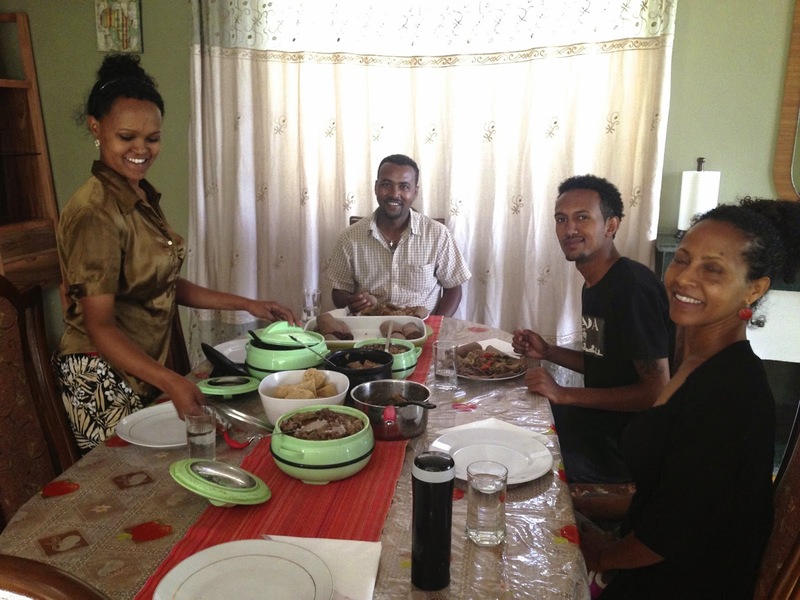 I also thoroughly enjoyed the comfort food and the supremely gracious hospitality from Dawit's mother, who was the woman in charge of the care center in Addis where Dawit grew up, and not Dawit's biological mother. 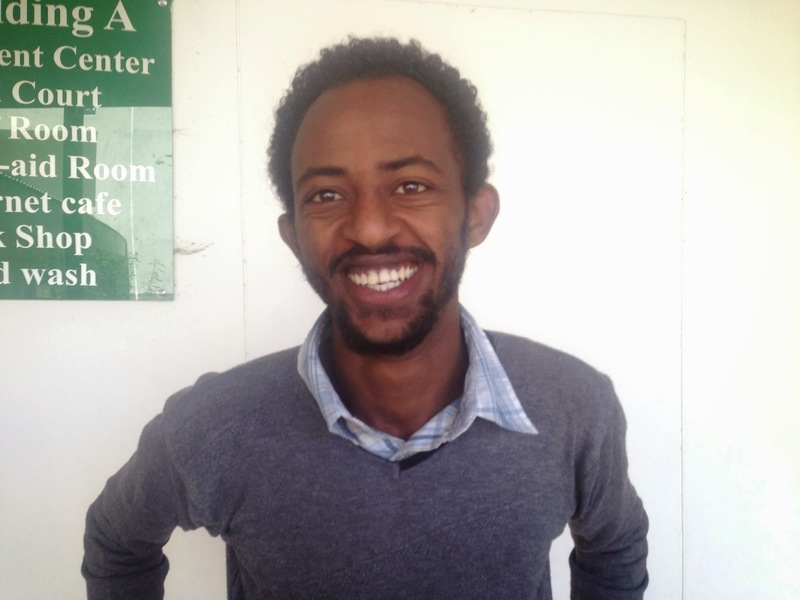 In fact, Dawit continues to expand my concept of family as he talks about his many sisters and brothers from his years in that supportive and loving community. Baked pasta with delicious vegetables. Dawit and I both ate so much. 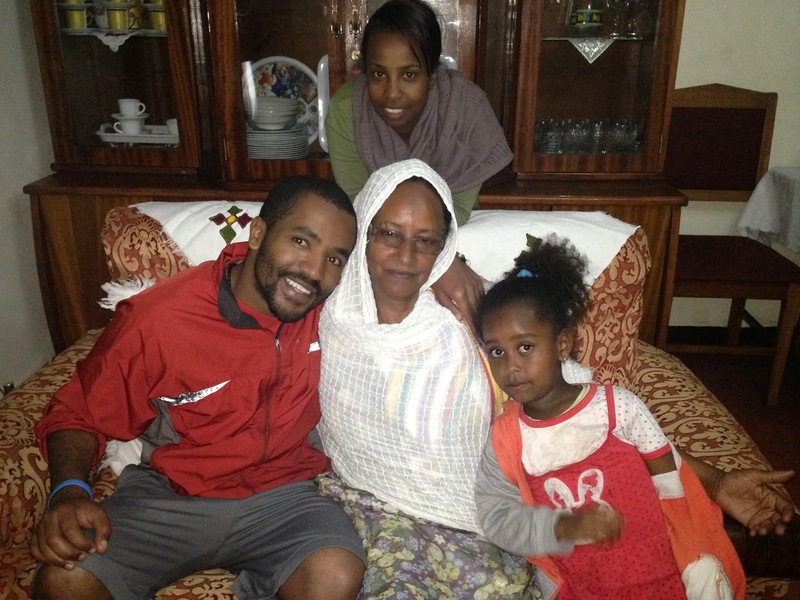 Dawit, his mom, and a neighbor's daughter on couch. One of Dawit's sisters stands behind. 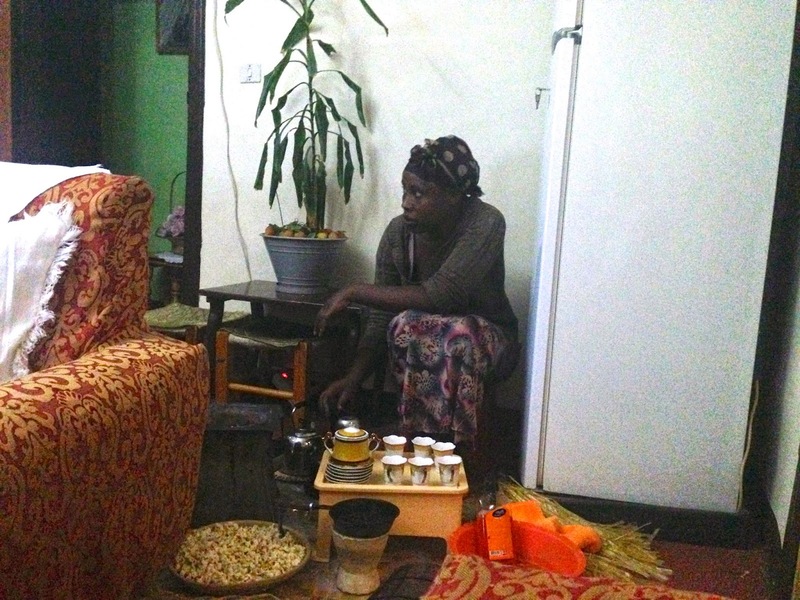 It's not uncommon in Addis for people to have live-in servants, and Dawit's mother had hired a Hadiya woman to take care of domestic needs. On this night she was in charge of the coffee preparation. 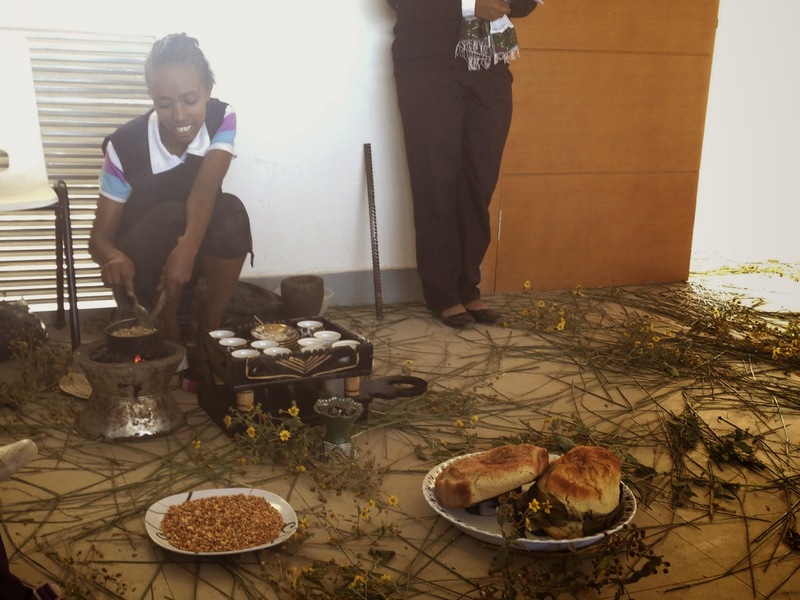 She prepared ወፍራም (wefram) coffee, which means "fat" but refers to the strength of the brew. I recorded this lovely woman saying a few words in her Hadiyya language, including the term for "thank you" (below), but unfortunately I left without asking if she recognized "Anemo" as a Hadiyya name that means "one who has found his father." I'm still regretting the missed opportunity, yet I will see if Dawit can ask his mother to find out for sure. Whatever Suzanne and I find out, we don't plan on changing the spelling or pronunciation of Anemo's name. Anemo will always be Anemo; his name will just have more layers of meaning now. And of course he will always smell as sweet. As I was leaving the house that night, I gave the kind Hadiya woman a photo of Anemo that I had in my wallet, leaving her to contemplate the kind of life this Hadiya boy is living in the United States. I bet she couldn't imagine him riding in the backseat of a car on the way to his Quaker school, playfully and ambivalently practicing the different versions of his Amharic/Hadiyya name. That’s my blood in that test tube. I know that because my name, እስቴፈን ለዛርድ (Ihstayfen Lezard) is written on the label. After I impressed the attendant with my healthy blood pressure, normal body mass index, and iron-weighted hemoglobin that allowed a droplet of my blood to sink through a copper sulfate solution, I was cleared to donate. 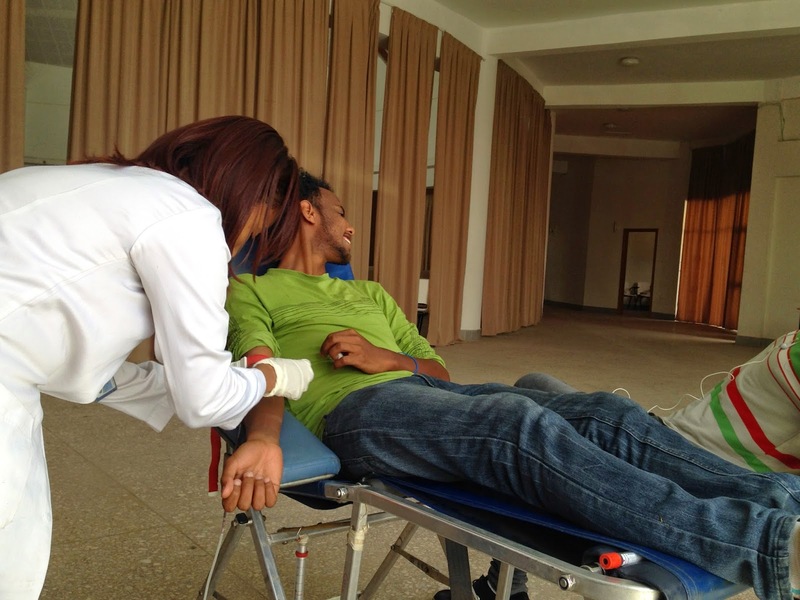 The blood drive took place in the meeting hall at the center of campus. 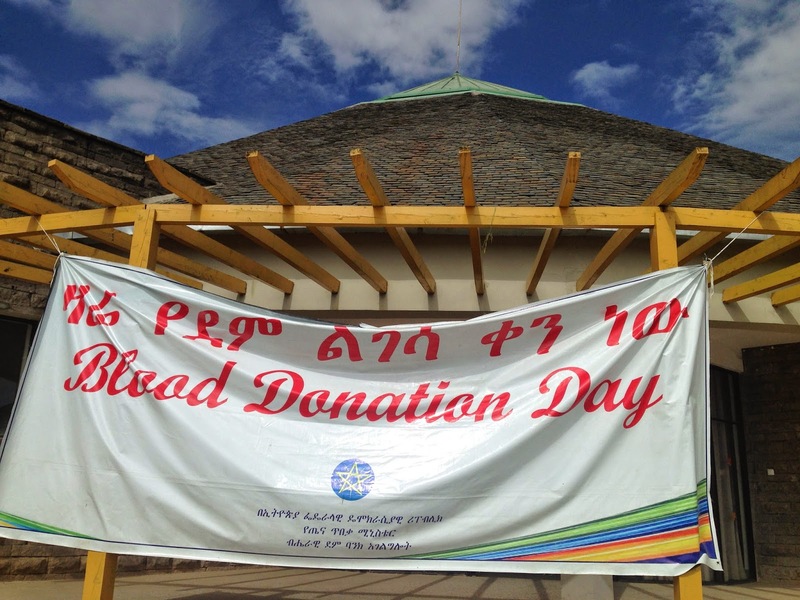 Yesterday was የደም ልገሳ ቀን (Yedem Ligesa Qan), or Blood Donation Day, here at Hope University College. I was slightly concerned about giving blood at 8,000 feet, but I went ahead anyway. 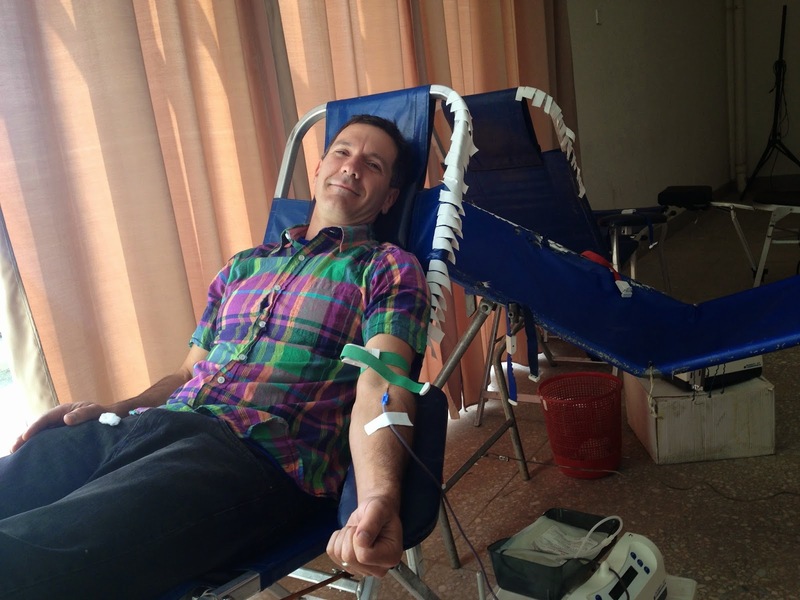 I figured it would be a good chance to think about the meaning and symbolism of blood while performing a good deed. I insisted on tape that matched my shirt. When you adopt a child, whether domestically or internationally, someone will eventually utter a sentence with the word blood in it. For Suzanne and me, that moment occurred this past summer upon arriving in Curaçao, when we were almost denied entry because Anemo was traveling on an expired Ethiopian passport. 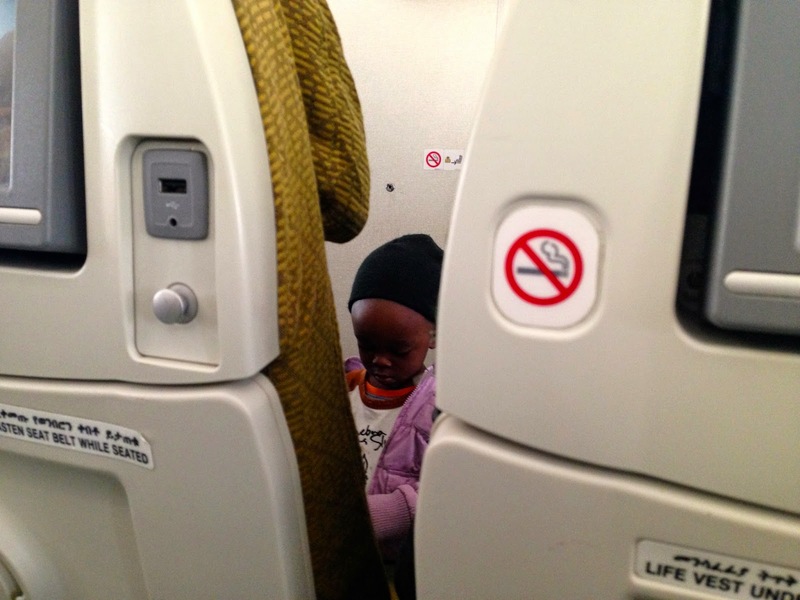 After Suzanne confirmed that Anemo was indeed our child, the immigration agent said, "Si, pero e tin bo sanger den su kurpa?" (Yes, but does he have your blood in his body?) To be fair, the general population of Curaçao has a generous view of adoption, with many children taken in by extended family or family friends and raised as if they were their own. But this isolated comment still stung... (and much more than the needle going into my arm). 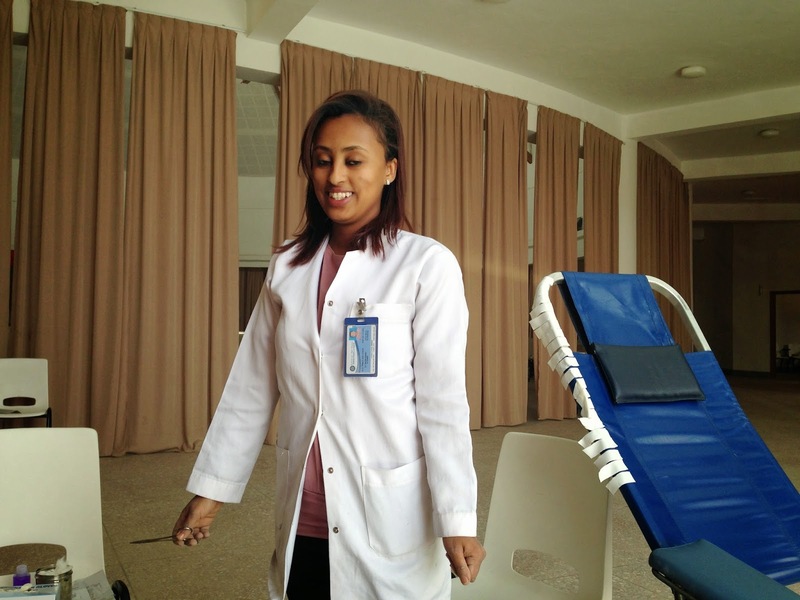 You don't get into the health profession here without good English skills, but she humored me by speaking Amharic. I certainly don't live life anticipating bad attitudes from people about our adoption of Anemo, but when I encounter one, I feel it deeply. The way an Eritrean restaurant owner (not Manna!) wouldn't look at our family directly while he took our order still haunts me. I understand international adoptions are controversial; I would just prefer to live above (or beside) the controversy. And yet I know one of the reasons I am undertaking this project, and living for a few weeks in Ethiopia, is to reduce the controversy somewhat, at least in our particular case. I want to do what I can to be the best case scenario for Anemo. I know I can't win over everyone, but if I've won over Anemo, maybe that's all that matters. I looked away too, but I didn't look THAT away. 'Blood is thicker than water' goes the saying in English, but I can't imagine a thicker connection with my son. It's definitely been challenging being away from Anemo and Suzanne for so long, and I was thrilled last night when we finally figured out how to video chat. At least while I'm away (for only one more week), I'm trying to take in all I can about the language and culture here. Keeping with the theme, I learned two Amharic terms at lunch yesterday using the word ደም (dem, blood): ደም መጣጭ (dem meThaCH), which means an oppressive person, like a bloodsucker I suppose; and ደመኛ (demenya), which can mean brave, or, in a different context, vengeful, as when one feels blood coursing through one's veins. While I probably won't remember these two more advanced terms, by metaphorically swinging two bats, I'll always recall the word ደም. 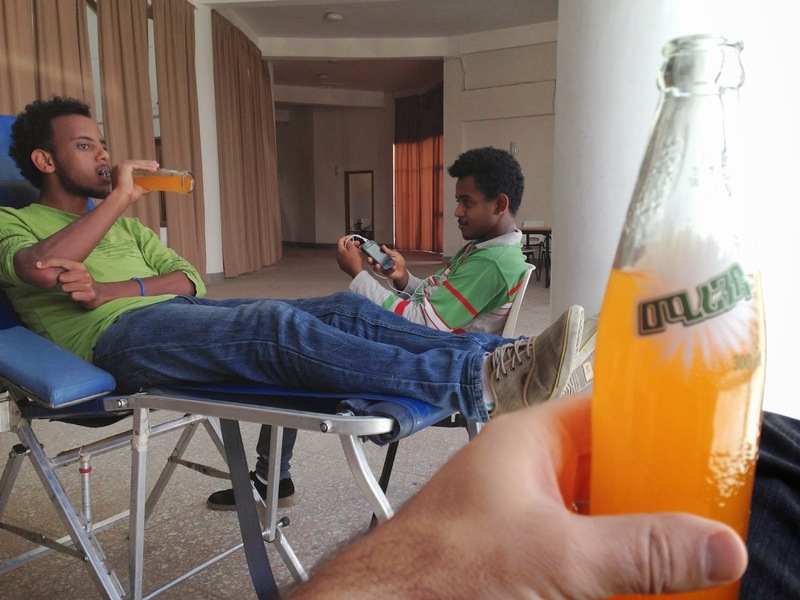 What better to replace a pint of blood than a pint of orange soda? So while my ደም will never "course" through Anemo's "veins," I can at least smile at the fact that some Ethiopian, at some point, will receive a pint of my blood, which hopefully will restore that person's life like Anemo has immeasurably restored mine. I've been residing at Hope University College for one week now, and, with the exception of one full day of vomiting and diarrhea, it's been a great experience. I've visited most of the classes offered here at ILAE, including Physics, History, English, Amharic, Geography, Biology, and Theater, and I've been impressed by both the level of instruction from the teachers and the level of engagement from the students. For instance, in history class, taught by a passionate Ethiopian guy named ክቡር (Kibur), students in groups of four assumed the role of ልጅ ኢያሱ (Lij Iyasu, heir to Emperor Menelik II) and delved into discussing the pros and cons of siding with either the Central or Allied powers during World War I. However, despite the progressive teaching methods at this leadership academy, some students apparently continue to voice concerns over being prepared for national exams. They say they just want to have "the teacher's notes" to know exactly what to study. Comments like these concerned the faculty to such a degree that they devoted the entire community meeting to explaining why ILAE's curriculum emphasizes critical thinking over memorization. 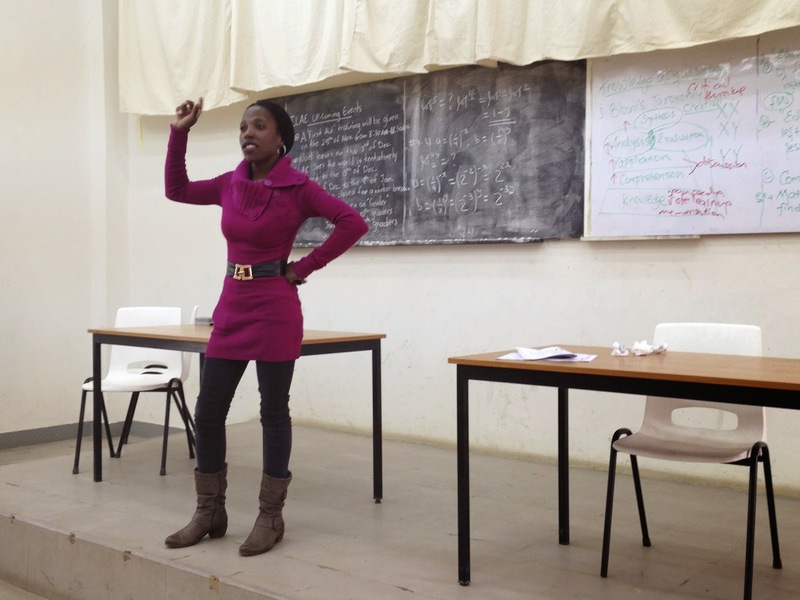 Lainah, the English teacher from Zimbabwe, talks to students about higher-order thinking. ILAE ninth and tenth graders at community meeting. In my first opportunity to address the students, I reinforced the importance of progressive education by referencing the ethos of innovation in Silicon Valley. Since this kind of education is such a break from what they've had before, my guess is that there will be a bit of mixing between progressive and traditional teaching methods. In Geography, for instance, the teacher lectured in a traditional way about the various types of rock and soil in Ethiopia; the one interactive moment came at the end when he solicited examples of how different ethnic groups in the country use the earth to mark their faces and bodies. These values are posted outside the ILAE classrooms. Sometimes the value of ጨዋነት (Chewanet, Respect for Elders & Others) can get in the way of challenging authority. Perhaps a blend is needed in the next generation of Ethiopian leaders. A page from the Civics textbook. 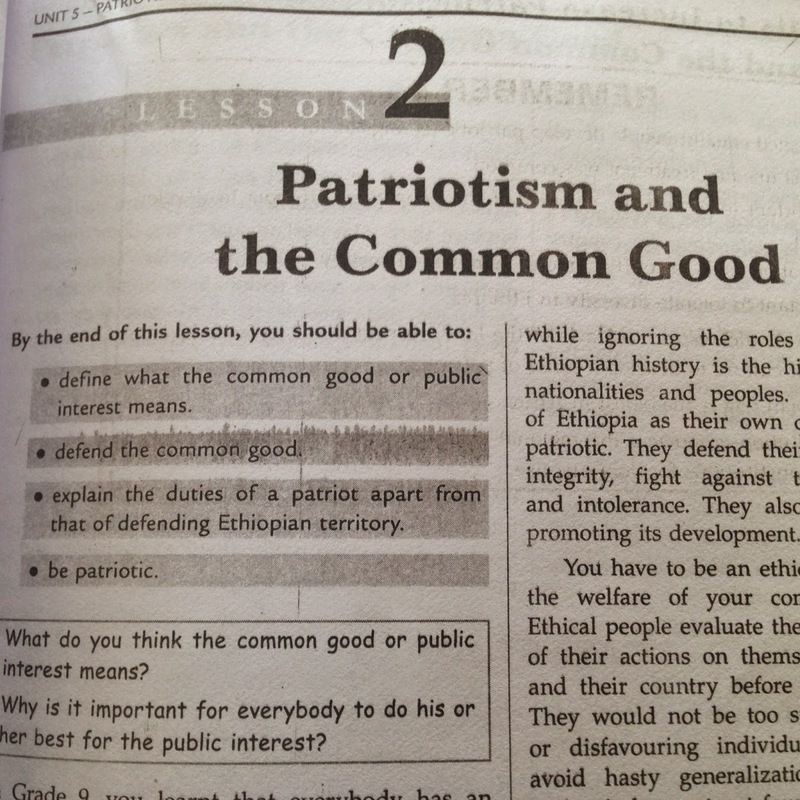 Having as one of the lesson's goals to "be patriotic" also subverts critical thinking. I've been thinking about different kinds of mixings here, especially as Ethiopia is a country with over 80 different ethnic groups. My hypothesis is that language about mixings or hybrids will reveal underlying attitudes about them, in the way that terms like "half-breed," "pure-blood," "mulatto," or "mutt" all have revealing connotations in English. It seems to me that Barack Obama is universally admired here. I see his name on many taxis around Addis. This is not surprising, since his father was born in neighboring Kenya. But what word is used for a racially-mixed person? 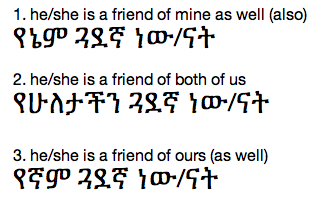 My online Amharic dictionary says ዲቃላ (diqala) means "racially mixed child" and it shows the same word for "hybrid." But according to the dictionary, ዲቃላ also means "illegitimate child." So how would an Amharic-speaking Ethiopian describe Barack Obama's identity? 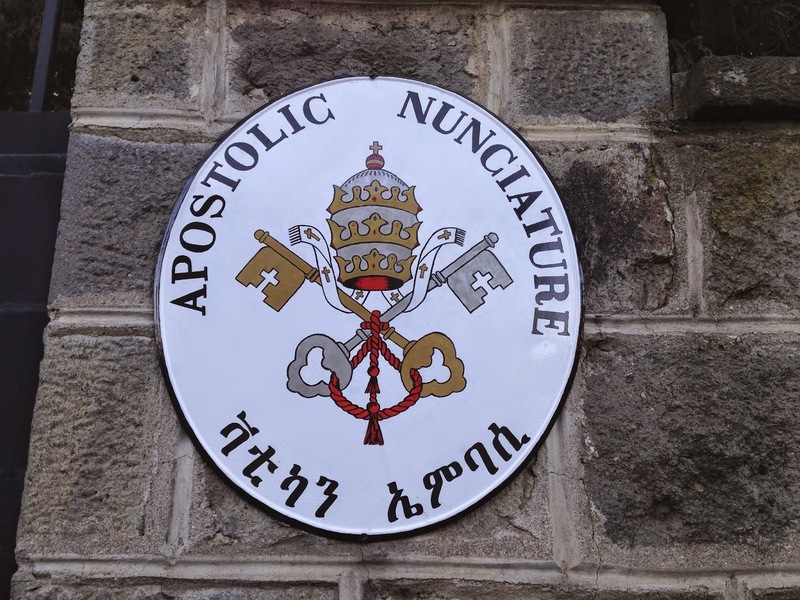 The Amharic teacher here at ILAE told me that ዲቃላ is almost always used now to mean a child born out of wedlock, carrying negative connotations. On the other hand, the similar word ማዳቀል (madaqel) has a positive connotation. Thus, one might say Obama is a product of ማዳቀል. 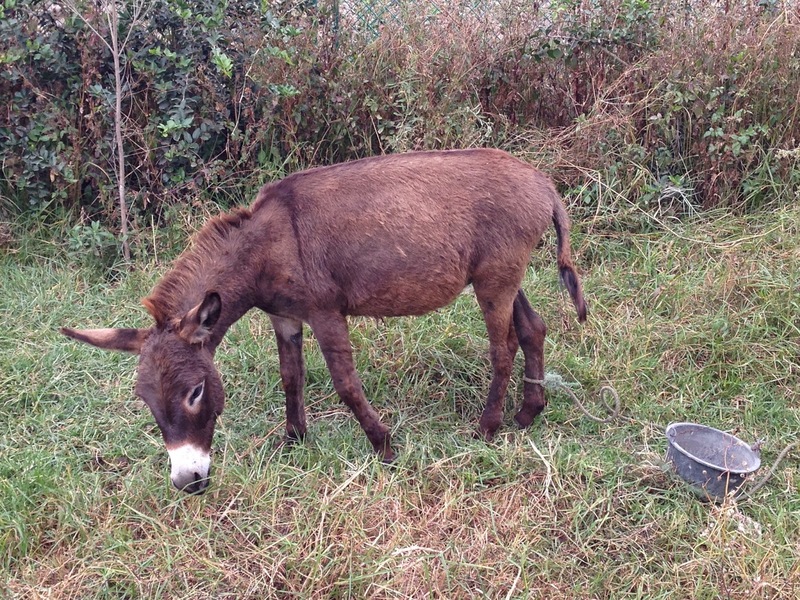 Many donkeys live around the campus; this one was grazing behind the library. I've yet to see a mule. 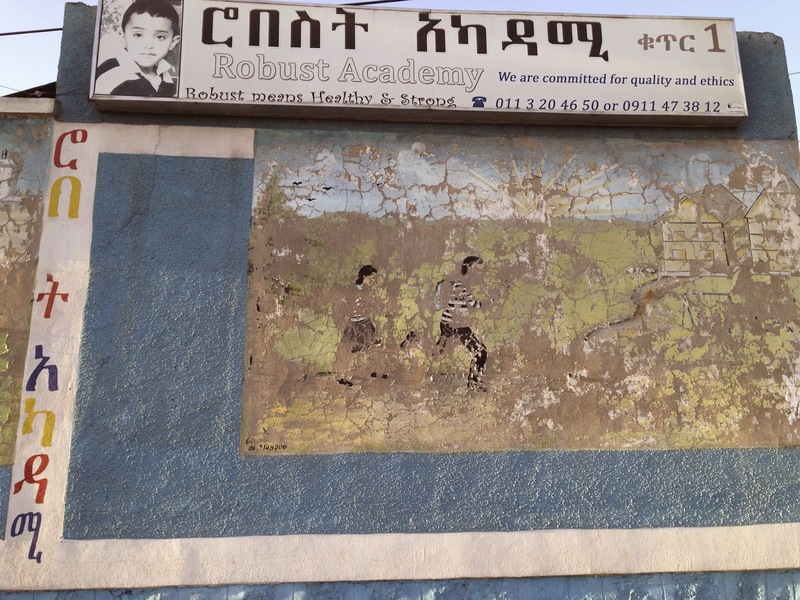 The other word that the faculty discussed at the lunch table today was the word ክልስ (klis), which they agreed was another positive term for a racially-mixed person. Interestingly, the infinitive መከለስ (mekeles) can mean "to dilute" (as with water to a stew) or "to revise" (as with improvements to an essay). Finally, I was curious if there was an Amharic word meaning 'bicultural' without reference to race at all. 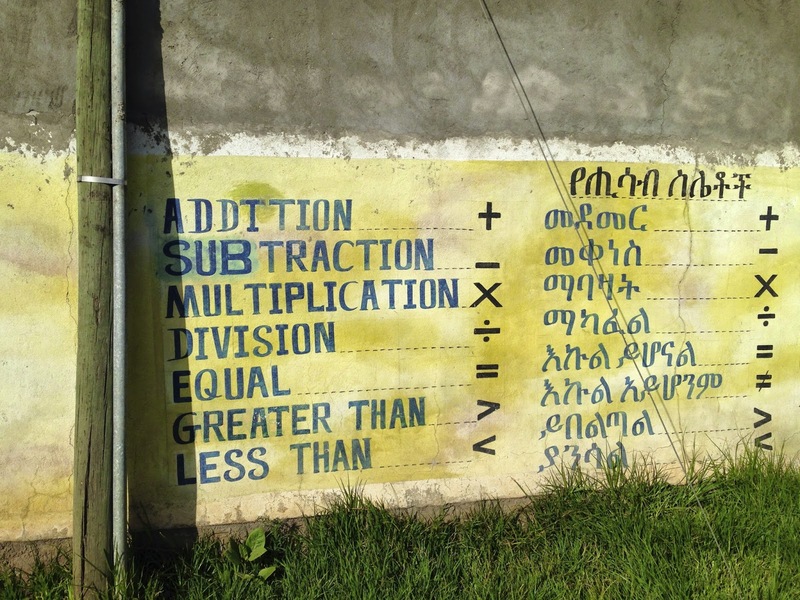 Dawit, the physics and math teacher, is probably the most bicultural person I've met in Ethiopia so far (tricultural if you count his secondary education in Ghana), and he informed me of a fantastic term I hope to use about Anemo: አለም አቀፍ ልጅ (alem aqef lij) — global (literally, world-hugging) child! And then there is culinary mixing. Every night I've been getting a ጁስ ስፕሪስ (jus sprees) before bed. It's a mixed juice blend of every fruit a shop sells, with a surprising emphasis on avocado. I've been trying to find out the origin of the word ስፕሪስ, because any word that uses a form of the 'P' sound (ፐ ፑ ፒ ፓ ፔ ፕ ፖ ፗ) is necessarily a foreign word, like ፒዛ (pizza) or ፖስታ ቤት (posta bayt, post office). 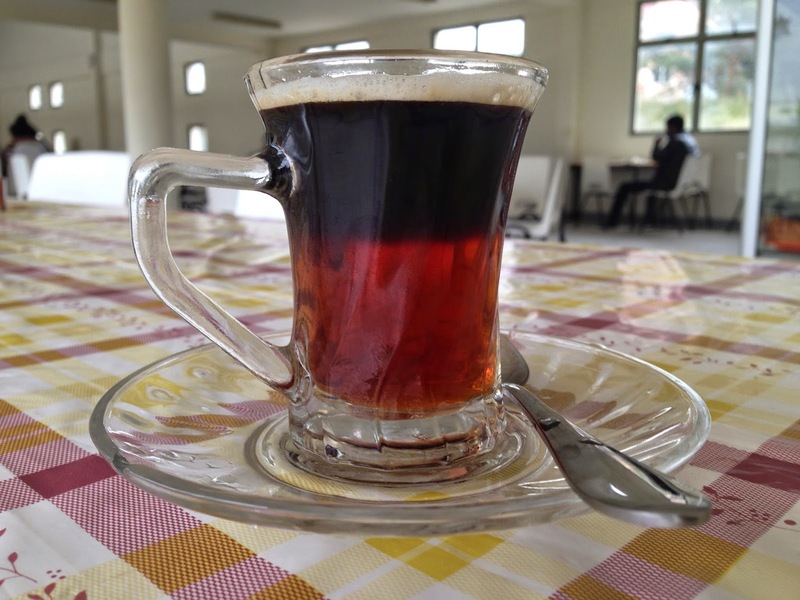 There's even a drink called ቡና ስፕሪስ (buna sprees), which is a mixture of tea and coffee. When I consulted the Amharic teacher, he claimed sprees came from the word "espresso." I pointed out that espresso had nothing to do with mixing or blending, but he couldn't think of another explanation. Until I hear otherwise, I'll assume he is correct. This is where I get my jus sprees. 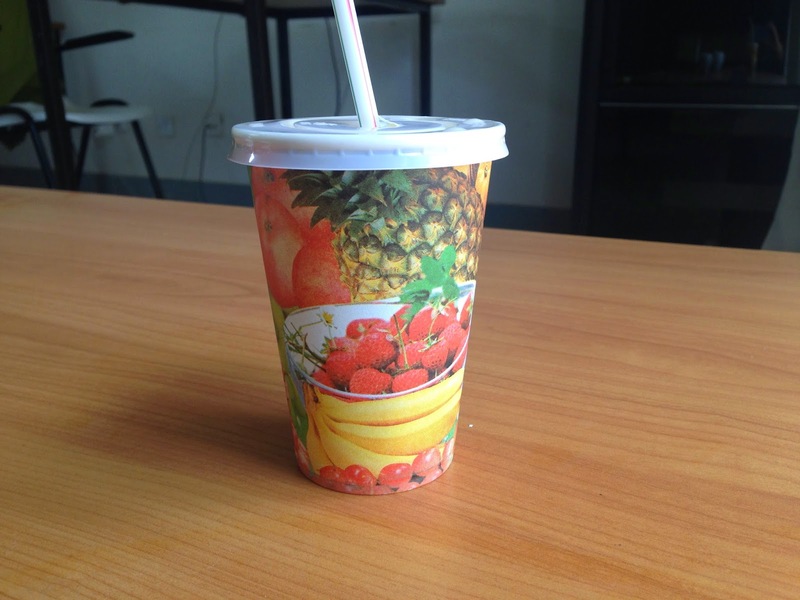 ጭማቂ (CH'maqi) is the Amharic word for juice. 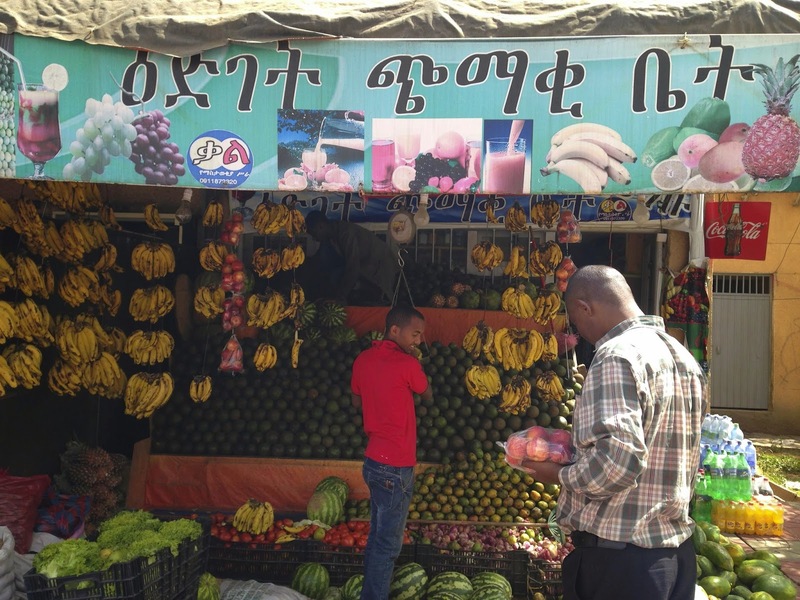 ዕድገት (idget) means growth, emphasizing the health benefits of drinking fruit nectar. The cup tells the whole story of jus sprees (minus the avocado). The majestic Buna Sprees. In England this might be called a Black and Tan. Imagine, I never have to decide between coffee and tea again! 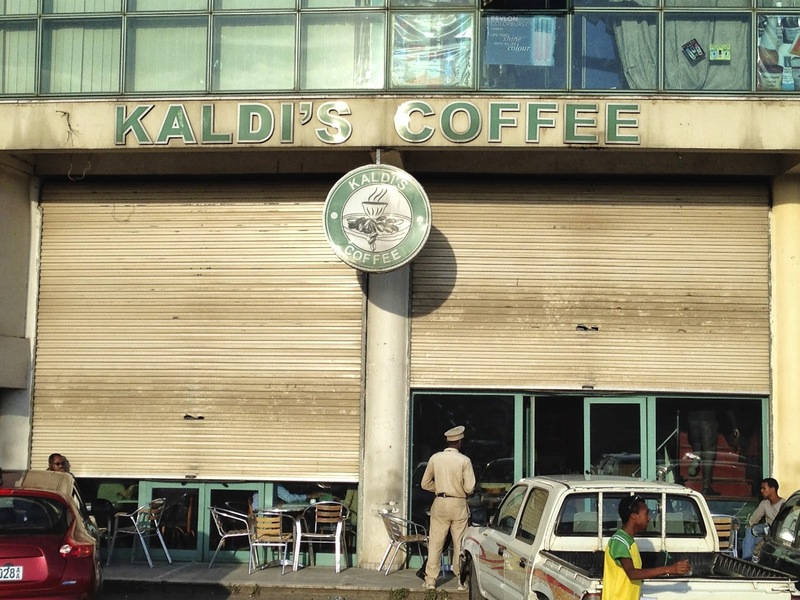 Ethiopia is clearly on p-time. When I saw the director of ILAE, Panos Hatziandreas, on Friday, he was heading off to some government office to discuss more bureaucratic paperwork. He wasn't sure what to expect, he told me, because the government had just instructed him to come "in the morning." Plus, he knew that at any time an official could deem another meeting more urgent and not show up at all. I could tell that operating in p-time was frustrating to him. At least Panos has control over the schedule here at ILAE, and at last Wednesday's faculty meeting, I witnessed a discussion about the timing of a community event to be held two days later (now last Friday). As Panos's wife and children had just recently arrived from the United States, the students wanted to officially welcome them to Ethiopia. Panos was game, and he suggested the last class of the day be shortened by fifteen minutes so that the ceremony could take place from 3:00 to 4:00 PM. (Such careful accounting of minutes is a hallmark of m-time.) Not surprisingly, the teachers of those final classes asked why the ceremony couldn't simply take place at the end of the school day. No one could think of a reason why not, so it was settled: the event would run from 3:15 to 4:15 PM. However, the faculty was trying to impose an m-time attitude onto a p-time situation. The actual event, complete with coffee ceremony, slide show of Ethiopian history, the reading of several epic poems, and an extensive interview with Panos and his wife, didn't get started until close to four and went almost until six. And with the exception of two of the non-Amharic speaking teachers, everyone remained to the very end, at which time the original idea of shaving fifteen minutes off of classes seemed absolutely ludicrous. Perhaps ILAE can embrace a healthy blending of m-time and p-time systems. 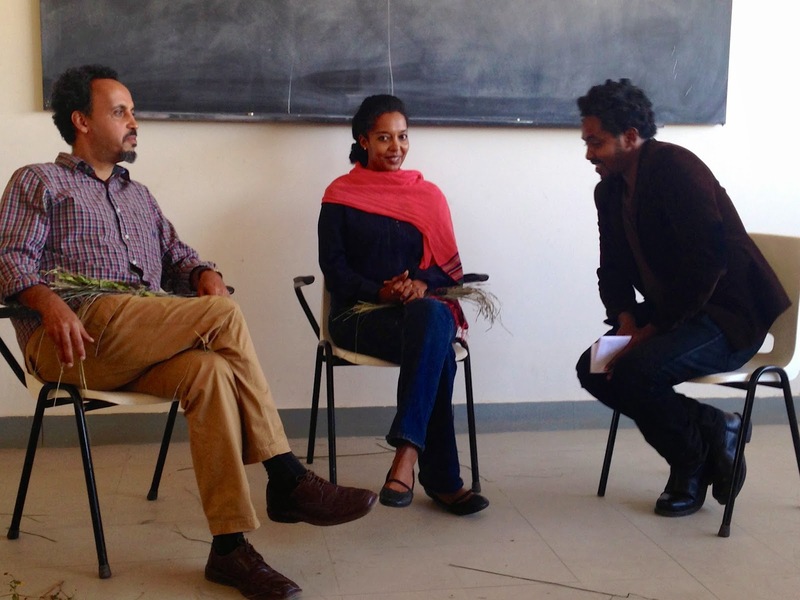 Panos (left) and his wife, Nunu, being interviewed by Michael, ILAE's Amharic teacher. A student roasts and brews delicious coffee for all the adults. That's ቆሎ (qolo, roasted grain) in the plate on the left. Below is an excerpt of the interview. I enjoyed listening to Panos's wife because her insertion of English words gave my brain a rest and allowed me to process more of the Amharic. There's even a word in Amharic for the mixing of English and Amharic: ጉራማይሌ (guramayley). I might as well just tell people that's the language I speak! For the last two days, I've been living in an apartment on the campus of Hope University College, where the International Leadership Academy of Ethiopia (ILAE), the high school I'm visiting, has its offices and classrooms. 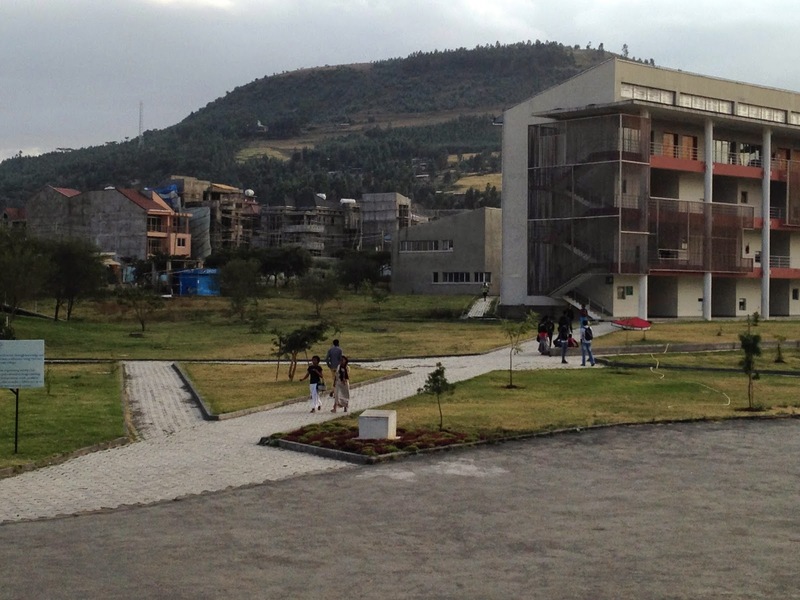 The attractive, open campus is located right near the relatively new district of Jemo (ጀሞ). Dawit, the physics and math teacher at ILAE, told me that few "faranjis" (ፈረንጅ = foreigner or "whitey") come to this area, so I'll probably be more of a curiosity here than in other parts of the city. 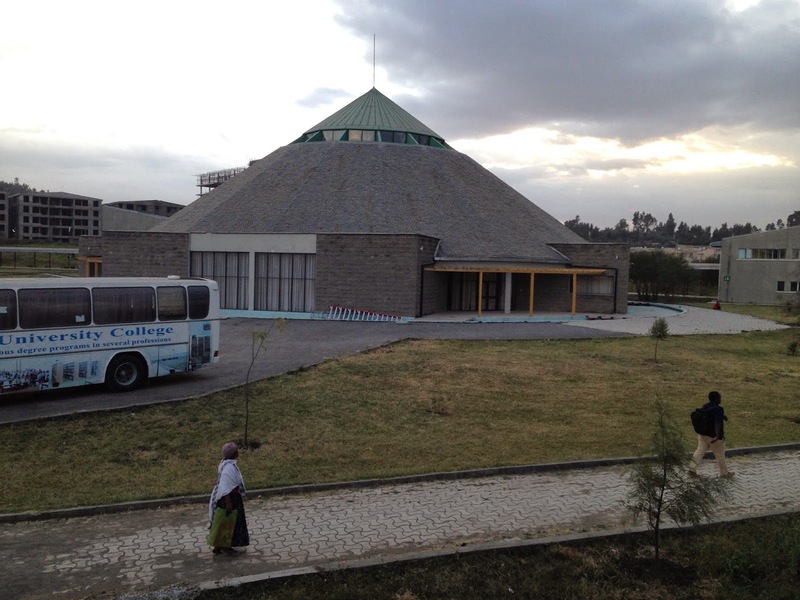 Jemo's relative lack of experience with tourists should allow for more interactions in Amharic. 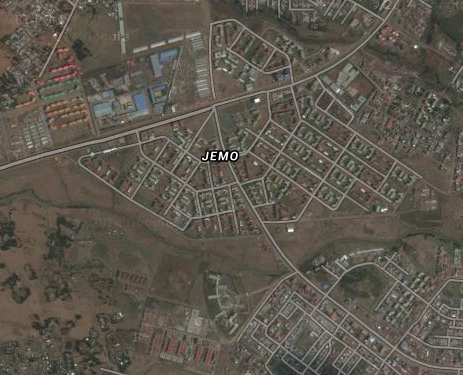 Jemo is a relatively recent neighborhood in the south of Addis featuring multistory apartment complexes. The yellow shape at the bottom shows the footprint of Hope University College. 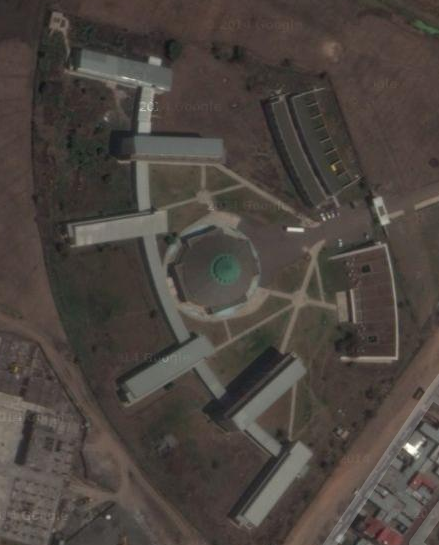 Satellite view. 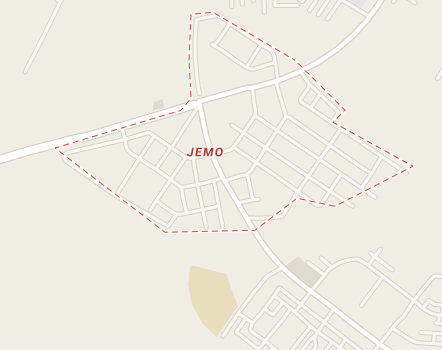 Jemo is clearly a planned neighborhood. My apartment is at the southwest corner of the northeast building, which is reserved for guests and faculty. A view of the apartments. There are many unoccupied because the school is still adding one grade per year. ILAE will be fully enrolled and staffed by the fall of 2016. The view from my balcony of the auditorium/church at the center of campus. Another view from my balcony. I attempted a run up that hill in the background, but I didn't get very far. I'll try again once I'm over jet lag and better adjusted to the 8,000 feet above sea level. It's a whole different world on that hill where there's no chance of speaking any English. I can't wait to explore more. Maybe I'll work up some questions for this young cowherd. On the other hand, during my first two days I stayed in a very different neighborhood (Mekanisa) that contains many embassies and expatriates, so my presence on the streets did not arouse much attention. I spent most of that time walking around, going to Western-style coffee shops, and chatting with Almaz, an Ethiopian-born woman who rents rooms in her beautiful house. As Almaz has spent more than half of her life in America, leaving as a refugee through Sudan and ending up in the Boston area, we spoke exclusively in English. Yet I was able to get my linguistic feet wet by practicing greetings with the few helpers she employs. 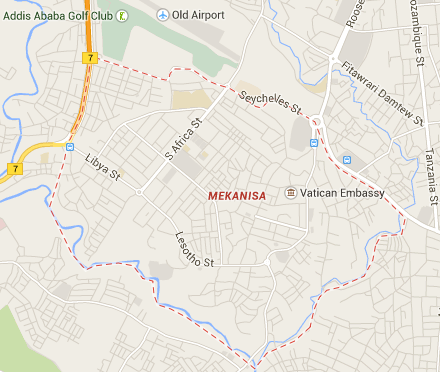 Mekanisa is also known as "Old Airport." If I get over to the golf club, I'll look for the old landing strip. 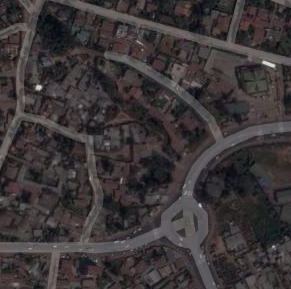 Almaz's house is at the end of that curved road just above the roundabout that joins Egypt and Lesotho Streets. A close up view. Her compound is next to those trees in the upper left corner. A view of the yard from my balcony. Seeing English words (Vatican Embassy, in this case) transliterated into Amharic helps me practice the Fidel and test my own spelling intuition. Amharic tends to err towards longer vowels when transliterating English; thus the words above might be pronounced more like Va-tee-can Aim-ba-see. 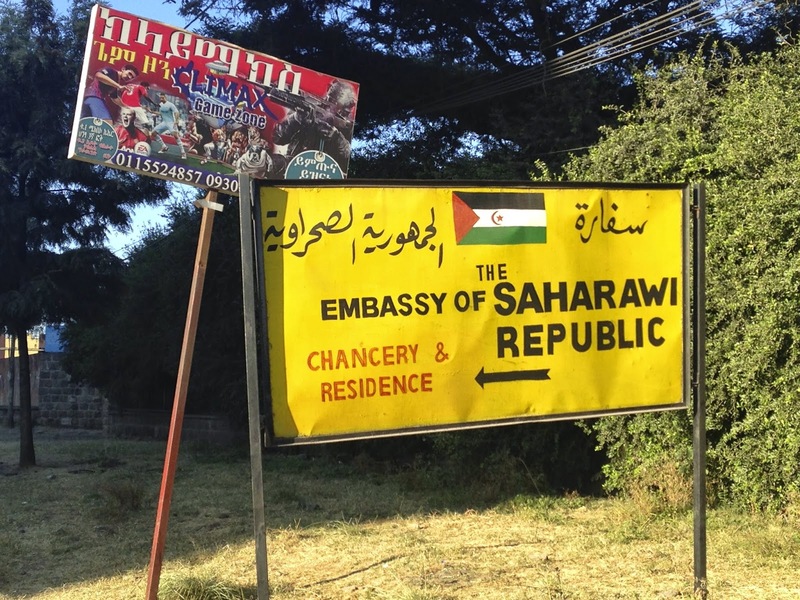 The Saharawi Republic is not part of the United Nations, but it was extended membership in the African Union. The "wi" sound that makes a word into an adjective (which I wrote about earlier) shows another linguistic connection between Arabic and Amharic. In addition to embassies, the area has a lot of schools. I'll use this photo if I need to talk about math. The Robust Academy needs some more robust artwork. 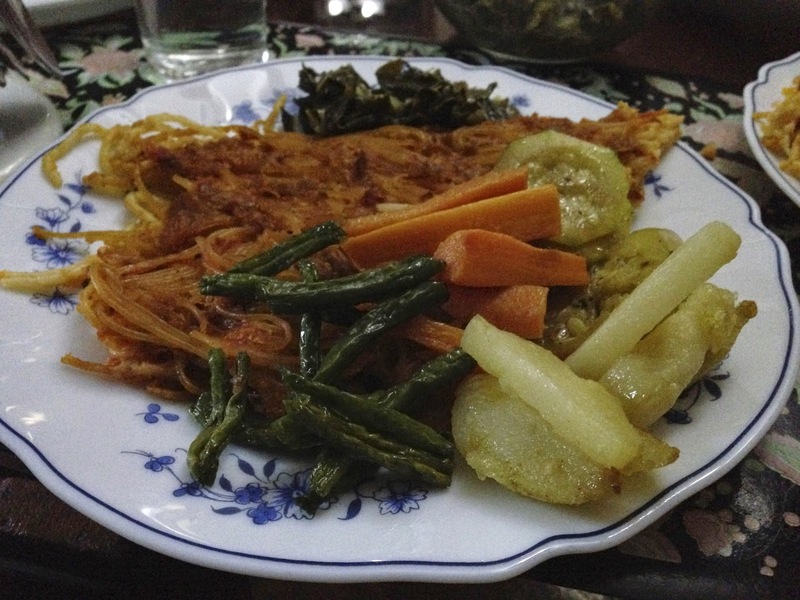 Dinner on my first night in Addis. Almaz opened up a bottle of Cabernet and used some of the Tillamook Cheese I brought for her. The topic of adoption dominated our conversation, which I thoroughly enjoyed. 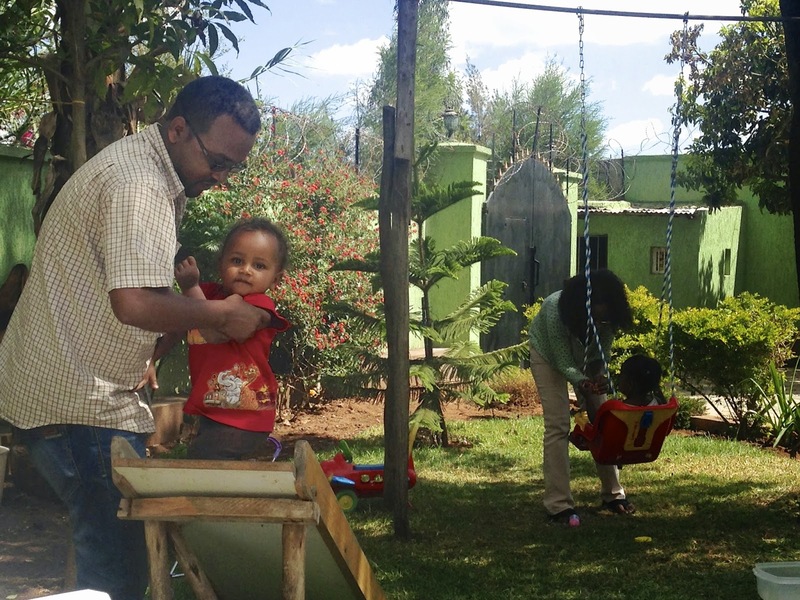 Almaz worked eight years for All God's Children in Portland, Oregon, adopted twins domestically in Ethiopia, and has foster parents in Maine. Her life story is one of resilience and independence. Great woman. The Ethiopian Cabernet was pretty good! It's a young industry now, but I expect it will grow very rapidly. 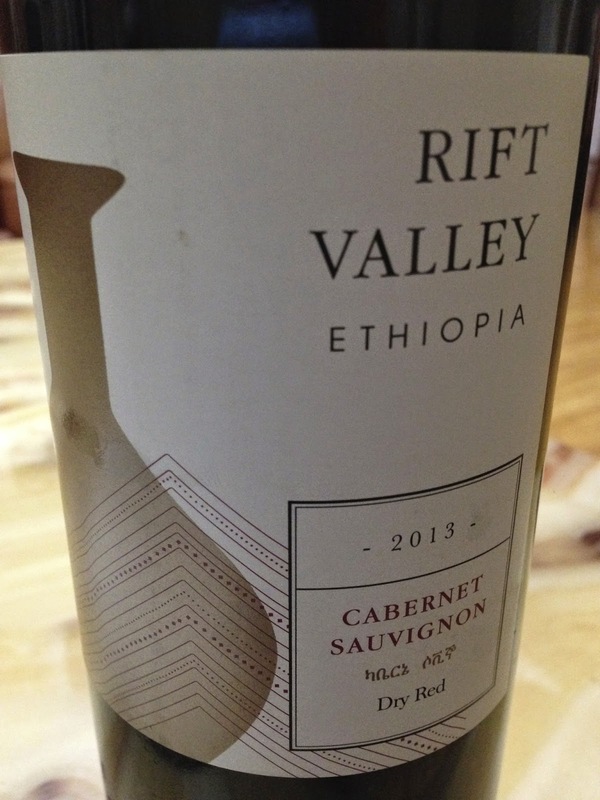 ThirdEyeMom wrote a nice blog about Ethiopia's Castel winery. Almaz and her brother Yohannes with the twins. A big lunch on my second day. The injera was delicious and very dark...definitely 100% teff flour. 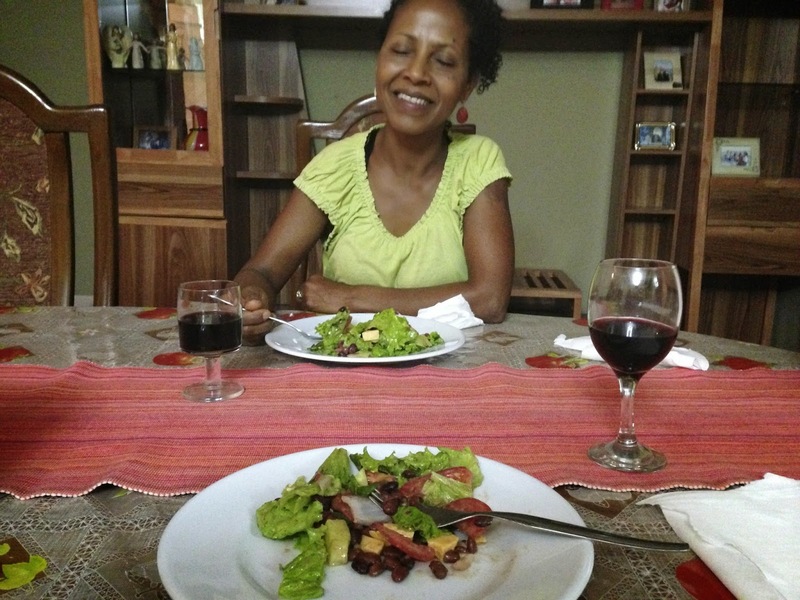 Almaz's niece on the left did most of the cooking. Delicious food. I plan to see Almaz at least once more before I leave. I also hope to visit with members of Lulit's family, who also live in the Mekanisa area. While I enjoyed the comforts of the neighborhood, it's better for me to be in Jemo, where people on the street typically won't speak to me in English. However, it's nice to know the comfort of a real flaky croissant is only an hour's dusty walk away. 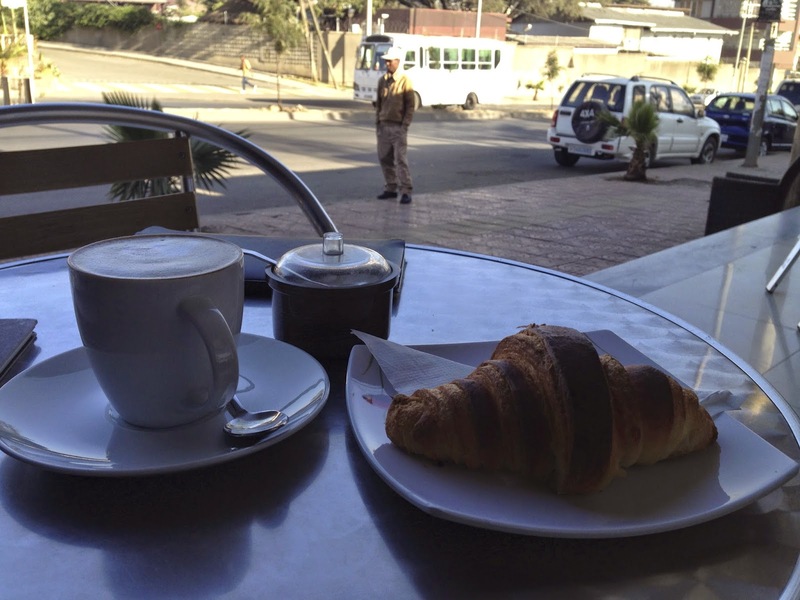 A morning treat at Bilo's Pastry Cafe. Lulit told me this was her favorite cafe. Just in case I was missing a particular American coffee chain. 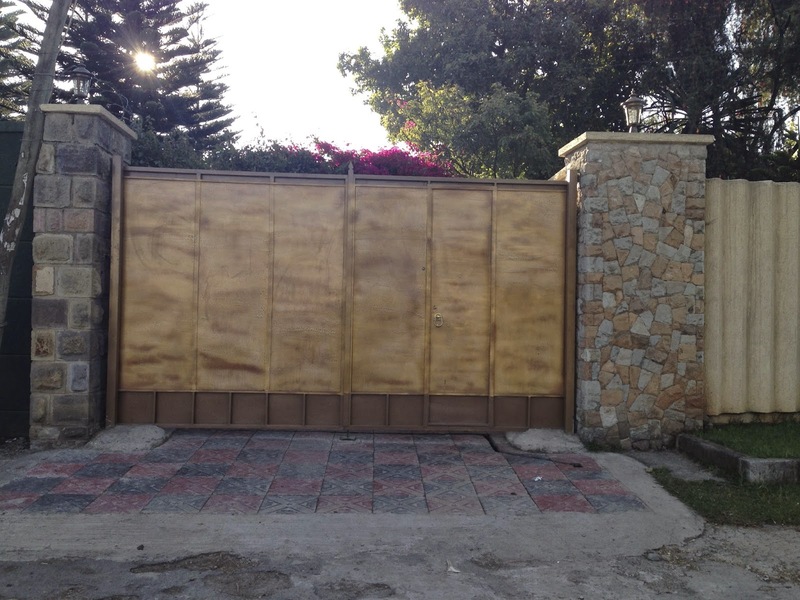 The gate at Lulit's family's house. Lulit had pointed her house out on Google Earth, so it was not hard to find. I will resist the desire to go back and sleep in my bed at Almaz's house. Finally, enjoy this quick tour of my apartment on the Hope University College Campus. You'll see evidence of persistent jet lag in my introduction. Also, I probably should not have worn flip-flops to make this video! 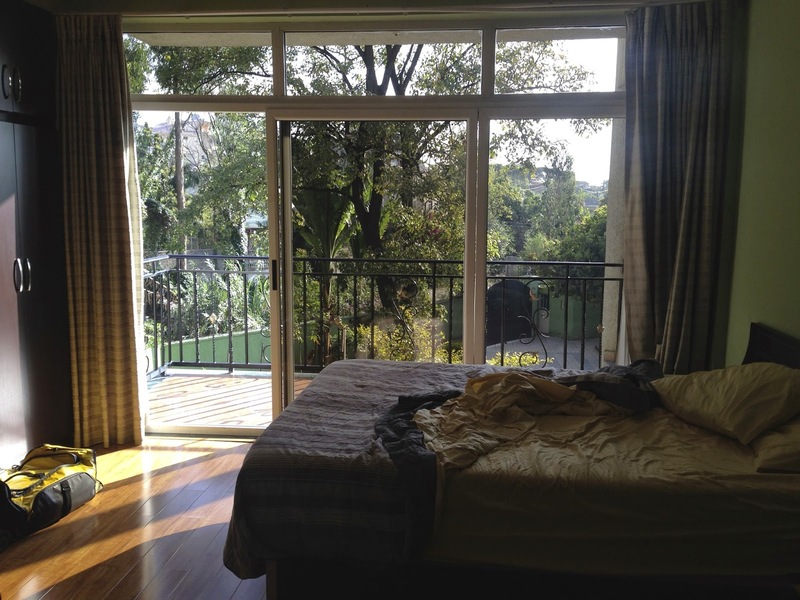 I'm writing from the Nefas Silk Lafto district of Addis Ababa. I've been here almost 48 hours, staying in a guesthouse near the roundabout that connects Egypt and Lesotho Streets. I have plenty to say about my first two days here (a Saturday and Sunday) and pictures to upload, but since I have not yet established a wifi connection for my own laptop, I will use the house computer to write about a movie I saw on the plane ride over. It was great to be surrounded on all sides by Ethiopian families speaking Amharic. The first movie I watched was called Wede Fikir (ወደ ፍቅር), which translates as "Towards Love." It involved a tall, quiet (and rather boring) man who for some reason tells his family he's already married. So then his crazy friend tries to match him with all sorts of ill-fitting women while the hero has already fallen in love with a neighbor suffering domestic abuse from her angry, jealous husband. This film is fairly straightforward in its portrayal of philandering and domestic violence as detrimental to Ethiopian society. The other film, called Ayrak (አይራቅ), meaning something like "Don't Be Far" or "Don't Let It Be Far," was much more interesting. It tells the story of two bright students from a rural part of Ethiopia who have professional ambitions and plan to marry after fulfilling their educational goals. However, the male student is called away to take care of a family member, and when he returns to the village two months later, his future wife has already left for the capital city. The movie takes place after seven years have passed. 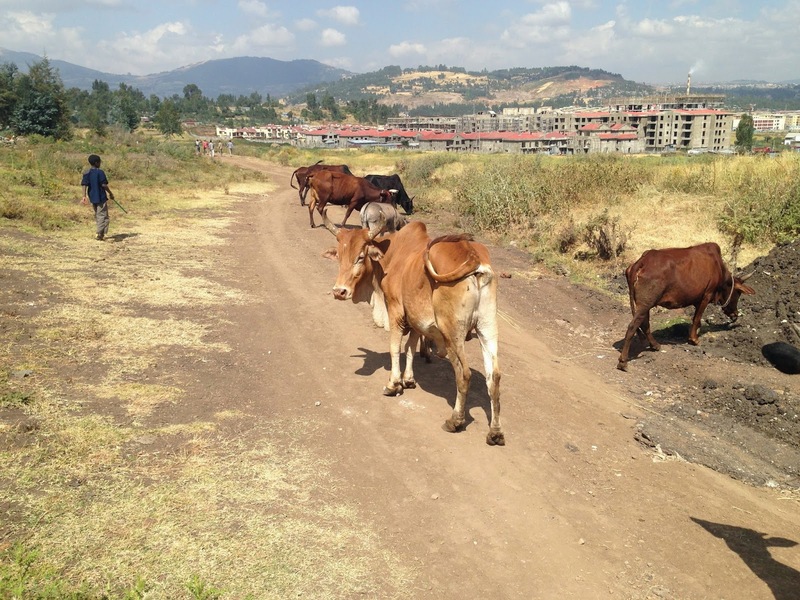 The man has remained in the village and become a farmer; the woman ends up running a big environmental project in Addis Ababa for the United Nations. The man hears this news and decides to track the woman down to fulfill the promise of marriage (he wears her ring around his neck). At the club, the country man can't stand the music and declines multiple invitations to dance. UNTIL a traditional Ethiopian song starts to play. (You can tell by the clapping.) The music makes him feel at home in this strange environment. When he starts rapidly pulsing his shoulders to the rhythm, the woman shows her approval. Meanwhile, a successful yet sleazy man pursues the woman for marriage, but she ultimately chooses to chase after her first love, who has by now returned to his village. The fairytale ending implies the two will live together in rural Ethiopia, conveniently ignoring the reality of the woman abandoning her career to do so. The title of the film, Ayrak, seems to have multiple meanings besides the obvious one of physical separation. It could be saying that Ethiopian women should not get too far from expected gender roles (this movie would certainly fail the Bechdel Test); it might also be telling Ethiopians in general not to stray from traditional values of hospitality, kindness, and ethical living while the country undergoes rapid modernization. As bad as the film was, it gave me a lot to think about. 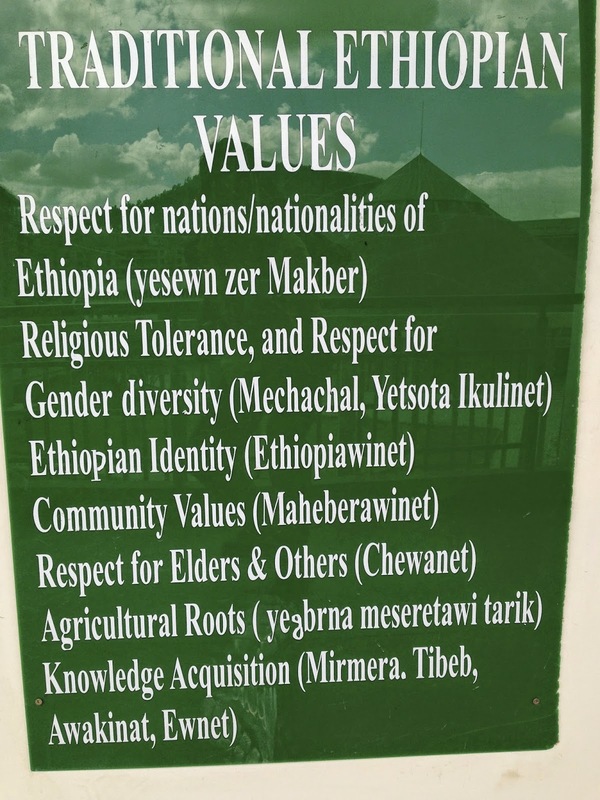 So as I am navigating the busy streets of Addis Ababa for the next two and a half weeks, far from home, I can pay attention to behaviors that indicate which values Ethiopians are holding close. I leave for Ethiopia yenega samint (የነገ ሣምንት, from tomorrow one week), flying through Washington DC on the way there, and through Rome and Toronto on the return. I booked this three-week experience (November 20 - December 11) back in early September, knowing I would need some kind of centerpiece to my language and culture project. Among other things, the trip will provide a much needed boost to my Amharic practice, which I have been neglecting lately. In my last conversation with Jan, we talked about the importance of visualizing my time in Ethiopia in advance, in as much detail as possible, to maximize the outcomes of my experience. Naturally, I plan on letting serendipity play its important role, but I also want to practice imagining specific meetings with specific people (or types of people), which is a new approach to travel for me. Such visualizations will encourage me to come prepared with relevant vocabulary. To take the easiest example, I can visualize the ride from the airport to the guest house where I will stay for the first two days. I just learned yesterday that a man called Jon will be waiting for me just outside the airport in Addis Ababa, holding a sign with my name. Jon is the brother of Almaz Asresahin, the woman who runs the guest house. Almaz and I were connected through a mutual friend named Jeff Blair, whom I met earlier this year in Seattle through a friend that he and I have in common. Learning the vocabulary to talk about these friend connections could provide material for my first conversation during the drive with Jon. Lulit tells me there is no term for "mutual friend," but there are several ways to express the same idea. I also plan to know more about the area before I get there, which could also be a topic of conversation. Jan recommended spending time on Google Earth to preview the landscape of Addis Ababa. 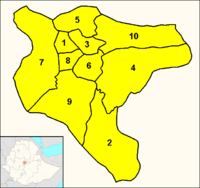 I just learned that the capital city has ten "subcities," and that Almaz's guest house is in the one called Nifas Silk Lafto (ንፋስ ስልክ ላፍቶ). Nifas Silk Lafto is number 9 on this map. 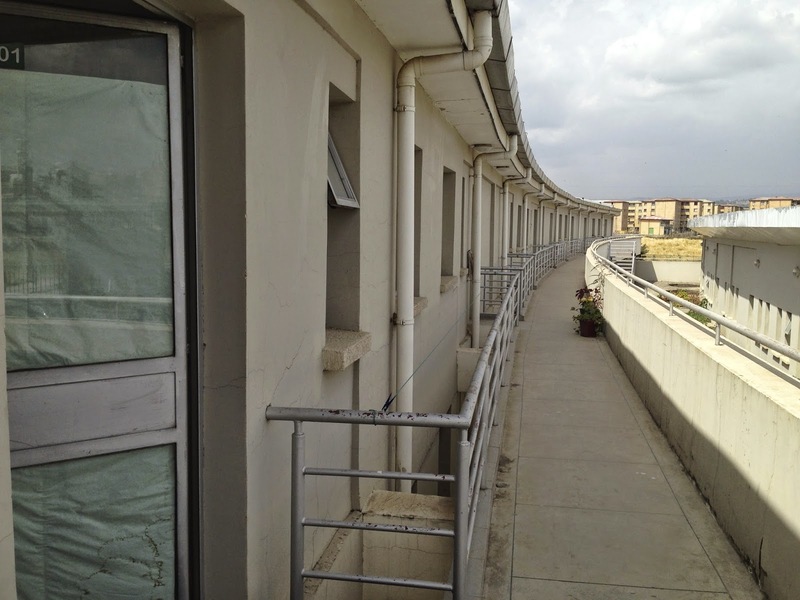 The Nifas Silk Lafto subcity is not far from Bole International Airport. 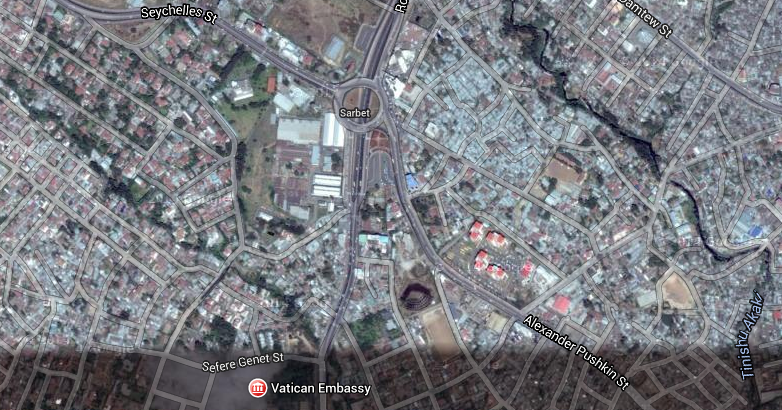 Almaz told me she is a short walk from the Vatican Embassy. The Akaki (ኣቃቂ) River, a tributary of the Awash River, runs nearby. 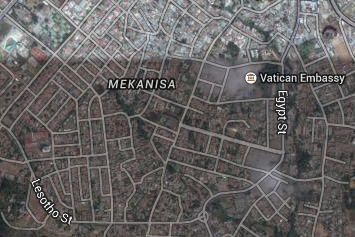 According to Wikipedia, however, "The city of Addis Ababa has made the Akaki its waste disposal site." I have no illusions about the prevalence of English worldwide, especially among people working in the tourist industry. I will certainly meet many people who speak English far better than I can speak Amharic. Most likely, Almaz's brother Jon is one of them. But the more I prepare vocabulary, phrases, and even full sentences beforehand, the more I can forestall switching to English. After all, making progress toward language fluency is one of the primary goals of my trip. Still another goal is to learn more about the imprisoned Zone 9 Bloggers. 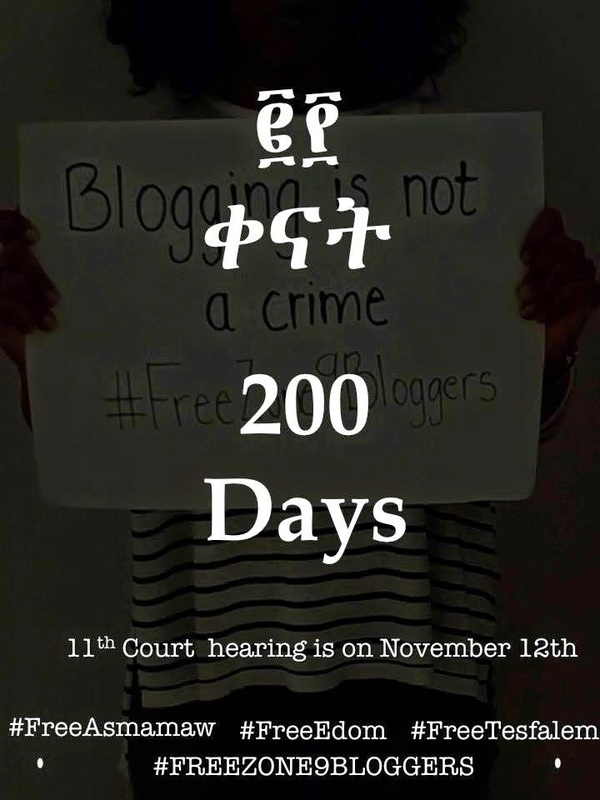 Just two days ago, the journalists reached their 200th day in Ethiopia's notorious Kality Prison. I hope they got some good news at their 11th court hearing today. If they didn't, and the government schedules another court date while I am in town, I visualize attending.